A couple more blades that have recently left my shop. The first is a camp chopper traded to another knifemaker for a kitchen knife for my wife. It's taken a loooong time for me to finish it up. 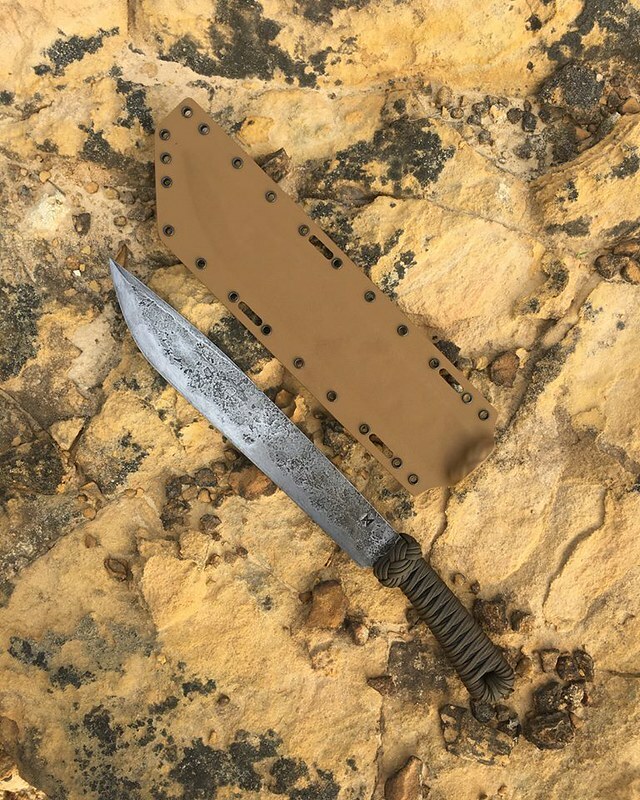 It has a 13" blade forged from 80CrV2 steel, with a tan over black paracord wrap and tan Kydex sheath. The second is a re-wrap on a CRKT Hisshou, designed by James Williams. I usually don't work on other people's blades, but this is the design that started me playing around with tanto designs of my own. 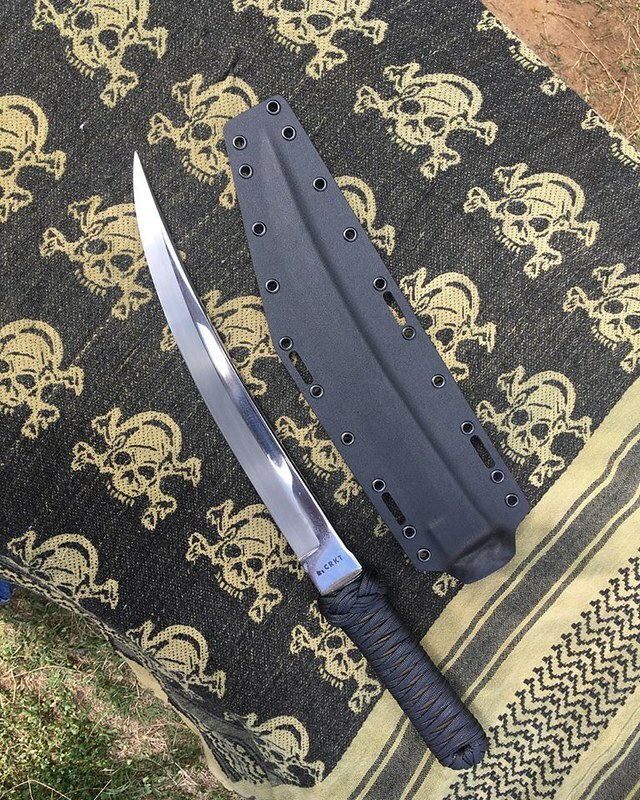 The customer had already stripped off the handle wrap and ray skin underlay, leaving the polymer bolster in place. I laid down a neoprene foundation, followed by a tan paracord underlay and tang paracord overlay, with a three-strand Turk's head knot on top of the bolster. The sheath on this is Boltaron, very similar to Kydex but less susceptible to temperature changes once molded. I think it has some better definition as well. The pistol holster guys like it. 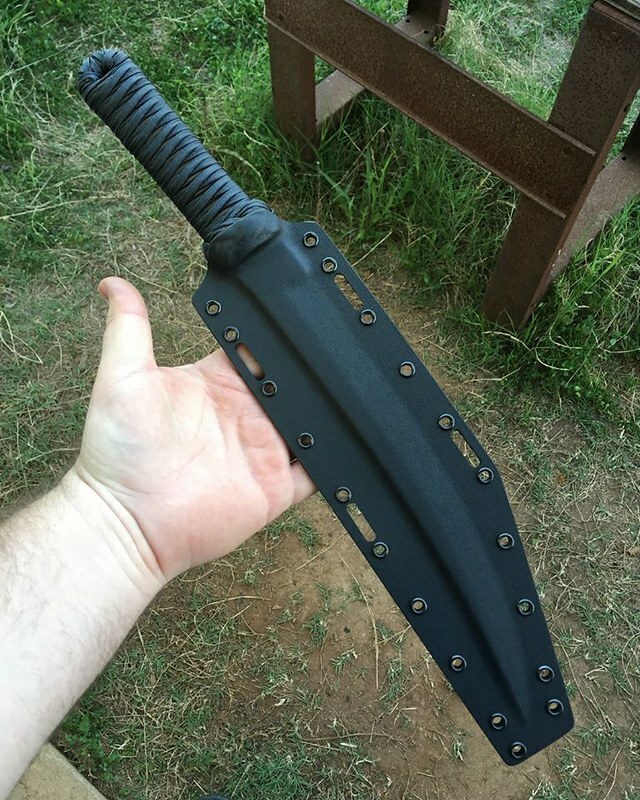 This is what I'll be using on sheaths now. The Hisshou is zero ground, something I've never done, but I touched it up with my stropping belt on my belt grinder with some green chrome compound. He noticed, sayin, "It's friggin' shaving sharp!" James Helm - Proud to be a Neo-Tribal Metalsmith scavenging the wreckage of civilization! The Hisshou was a very nice looking knife. It also looked a little wicked too!